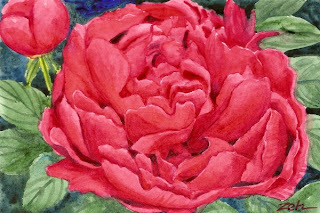 Peonies, particularly the big, double bloom type are more of a challenge to paint than roses, I think. They have so many layers of petals! This one is such a deep pink that it is almost red, but not quite. The peony plant is an easy one to grow, returning to bloom year after year as long as it is left in the same spot. After the blooms fade (and they never bloom for as long as I wish they would), the rounded shrub looks great all summer after which you can cut them back to the ground for the winter.